Zune Phone, anyone? 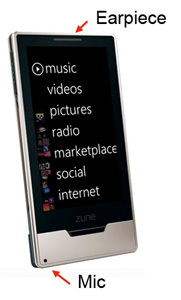 I don’t know about you, but I’ve been dreaming of a Zune Phone ever since the first ZuneHD rumours. Who knows if it’ll happen, but Engadget posted this mock-up of a “Zune Phone” and it just got me thinking… Microsoft could really put a dent into the iPhone’s dominance if they can produce a phone that was as good as the ZuneHD was a music player!